Dr. Elliott graduated from the University of Waterloo in 1999 with a Bachelor of Science degree in Biochemistry, as well as, her Doctor of Optometry degree. She received several awards while at the University of Waterloo including the Corning Low Vision Award, The Canadian Contact Lens Society Prize and two scholarships for summer research. Before starting private practice in B.C., Dr. Elliott worked at the Centre for Contact Lens Research in Waterloo conducting research primarily in the area of dry eye. 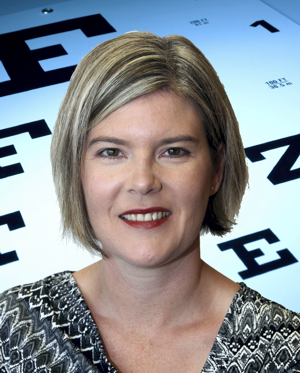 She has published many research papers and has been an associate editor of Practical Optometry (research journal). Currently Dr. Elliott is volunteering with the College of Optometrists of B.C. as an Investigator for the Complaints Committee. Previously Dr. Elliott was chairperson of the Motor Vehicle taskforce for the B.C. Association of Optometrists, serving as a member of the B.C. Driver's Fitness Advisory Committee. She also served as a director for the B.C. Doctors of Optometry. Dr. Elliott was a member of the Rotary Club of White Rock for 11 years. During that time Spectrum Optometry and the Rotary Club of White Rock partnered together to provide eye care missions to Honduras. Dr. Elliott has been practicing at Spectrum Optometry since she took over ownership of the clinic in 2002. She enjoys working with her husband, Matthew Elliott, who is the clinic manager. They both enjoy living and working in the White Rock community. Dr. Genereux graduated from the University of Calgary with a Bachelor’s of Science, and then completed his Doctorate of Optometry at the Pennsylvania College of Optometry. He studied in multiple locations including Pennsylvania, Florida, North Carolina and Alberta to treat varying diseases, including time within Veterans Affairs Hospitals, as well as the Feinbloom Low Vision and Rehabilitation Center. Dr. Genereux completed an Ocular Disease residency program at the Cincinnati Eye Institute affiliated with the Ohio State University where he treated various diseases of the eye including retina, cornea, cataract, neuro-ophthalmology, glaucoma, and ocular inflammation. Dr. Genereux then continued to work for multiple years in the cornea, cataract, retina, and neuro-ophthalmology subspecialty clinics, providing the highest level of care in conjunction with some of the leading ophthalmologists in their respective fields. Dr. Genereux has also been heavily involved in both clinical and basic science research, and has presented on many topics at regional, national and international conferences. He has published multiple peer-reviewed articles and continues to work on journal articles about ocular disease. Dr. Genereux lectures at multiple continuing education events for doctors at local and national levels, and has acted as an investigator for many clinical trials. In addition, he taught optometry students at Salus University in topics such as optics, ocular disease, and evidence-based medicine. Dr. Genereux is certified by both the National Board of Examiners in Optometry, as well as the Canadian Examiners in Optometry for the treatment and management of ocular diseases. He is a member of the Canadian Optometric Association, the British Columbia Association of Optometrists and the American Optometric Association. SPECTRUM Optometry is a full service eye care clinic serving the communities of White Rock and South Surrey British Columbia. Our Goal is Providing patients with the highest quality care, service and products to enhance their unique visUAL needs. After hours ocular emergency support is available by calling the main clinic telephone number and leaving a message in the emergency mailbox.